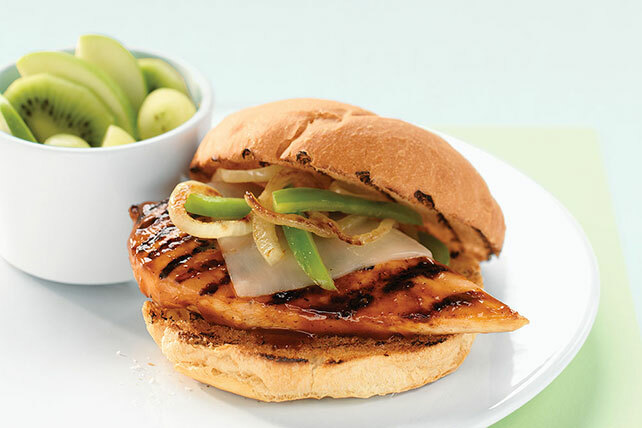 Try a refreshing summertime alternative to burgers with this Mozzarella Grilled Chicken Sandwich Recipe. It's ready to serve in 25 minutes. Grill chicken 8 min. Meanwhile, cook and stir vegetables in hot oil in large skillet on medium heat 5 min. or until crisp-tender. Remove from heat; cover to keep warm. Turn chicken; brush with barbecue sauce. Grill 7 to 9 min. or until chicken is done (165°F), turning and brushing occasionally with remaining sauce and adding rolls, cut sides down, to the grill for the last few minutes. Fill rolls with chicken, cheese and vegetables. For a whole grain alternative, substitute whole wheat hamburger buns for the kaiser rolls. Broil chicken 8 min. Meanwhile, cook vegetables in hot oil in skillet as directed. Turn chicken; brush with barbecue sauce. Broil 4 to 8 min. or until chicken is done (165ºF), turning and brushing occasionally with remaining sauce. Top with cheese; broil 1 min. or until melted. Continue as directed. Prepare using KRAFT DELI DELUXE Process American Cheese Slices.